While mosquitoes play important roles in the ecosystems in which they live, they are also pests and important vectors for disease transmission. While some insecticides help to lower the population of mosquitoes in a given area, many of these chemicals have detrimental effects on other species. Fortunately, mosquitoes have many natural predators -- including bats, dragonflies and mosquito fish -- that help to keep their population in check. Part of the order Diptera, mosquitoes comprise the family Culicidae. While the males of most species consume nectar rather than blood, females require blood meal to produce eggs. Females deposit eggs in water, and they hatch into larvae a few days later. The larvae feed and grow until pupating, eventually emerging as winged, mature adults. 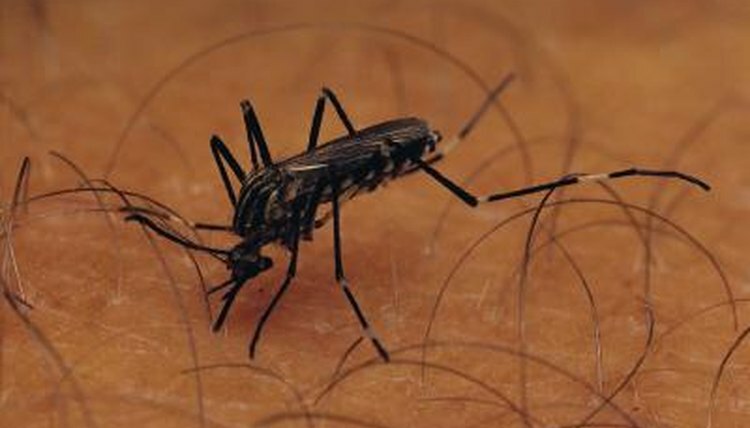 Mosquitoes are primarily crepuscular -- active at dawn and dusk -- and often live in shaded, windless areas near water. Many predators of mosquitoes hunt them while they are in the water. Mosquito fish (Gambusia affinis) are small, freshwater fish who consume a large number of aquatic insect larvae. Though humans have introduced these live-bearing fish all around the world to help with mosquito control, they do not preferentially consume mosquito larvae; instead, they simply consume whatever small, aquatic animals they find. Mosquito fish are not the only species who consume mosquito larvae -- most small, carnivorous species prey upon them opportunistically. Some dragonfly and damselfly larvae -- often called nymphs -- spend years living under water, where they capture and consume a variety of small animals -- mosquito larvae make up a large percentage of their total diet. A few frog tadpoles are carnivorous, and occasionally eat mosquito larvae, but most species graze on algae and detritus. Bats are incredibly important predators of nocturnal flying insects -- including mosquitoes. According to Merlin D. Tuttle of Bat Conservation International, some bats are capable of consuming more than 1,000 mosquitoes per hour. Much as boats use sonar to map their surroundings, bats emit high-pitched squeaks in a process known as echolocation, which allows them to find their prey. Jens Rydell et al., detailed observations of little brown bats (Myotis lucifugus) capturing flying mosquitoes in a 2006 issue of the “Journal of Zoology.” Remarkably, the bats successfully captured their prey 92 percent of the time. Purple martins (Progne subis) consume a number of flying insects, though being diurnal, relatively few of the insects taken are mosquitoes. Adult dragonflies capture many different kinds of insects; however, because they are generally diurnal, mosquitoes do not form a large portion of their diet. When hovering too closely to the ground, mosquitoes are subject to predators such as frogs, toads and lizards. While lizards are primarily diurnal, and do not consume many mosquitoes, they will capture them opportunistically. Frogs and toads are more often nocturnal or crepuscular and certainly consume mosquitoes; however, mosquitoes probably do not make up a significant portion of their diets. A 1997 study published in “Journal of Vector Ecology,” by S. Blum et al., noted that mosquitoes made up less than 1 percent of the diet of the frogs in their study area. Tropical Biomedicine: Aquatic Insect Predators and Mosquito Control.